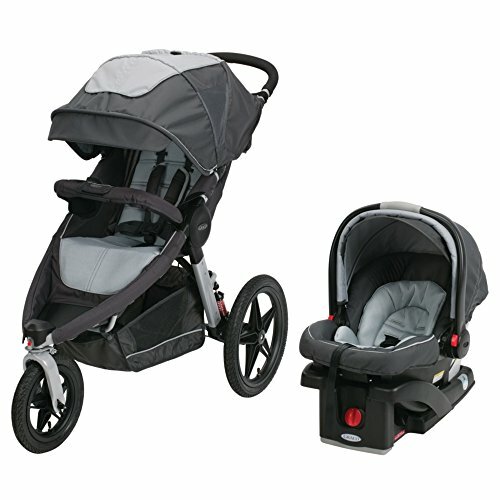 Graco's Relay Click Connect Jogging Stroller Travel System, in Glacier, is the ultimate performance jogger -and includes everything you need to involve your child in your active lifestyle. The included top-rated Snug Ride Click Connect 35 Infant Car Seat attaches to the stroller in a secure, one-step attachment. The jogging stroller is designed for avid joggers with air-filled rubber tires, locking front-swivel wheel with tracking, premium suspension and lightweight frame. Reflective, tech-fabric helps keep you visible in low light and the UV50 canopy gives your child sun protection. It's what you need to go the extra mile.